This is the complete brochure. It will take a few minutes to read. To get the most out of your Yellowstone Photo Tour, take our Digital Complete Nature Photo Course in Pennsylvania. Be totally prepared for a great shoot! Our Most Popular Domestic Photo Tour! 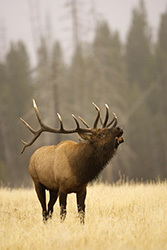 Perhaps in all of North America there is no better location to photograph large mammals than Yellowstone National Park. 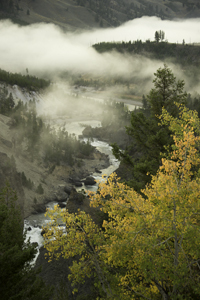 In fall, during the annual rut of elk, moose, and pronghorn, there is surely no better time or place to do so than in Yellowstone. Our photo tour will do exactly that, as this tour concentrates upon the large mammals, documenting their behavior at this most exciting time of year. Although our emphasis will be upon the large mammals, we'll be photographing virtually everything -- from macro to landscapes, birds to berries. .
Of course, in the Yellowstone high country we'll also do our best to seek out all the species of big game, including moose, mule deer, and pronghorn. 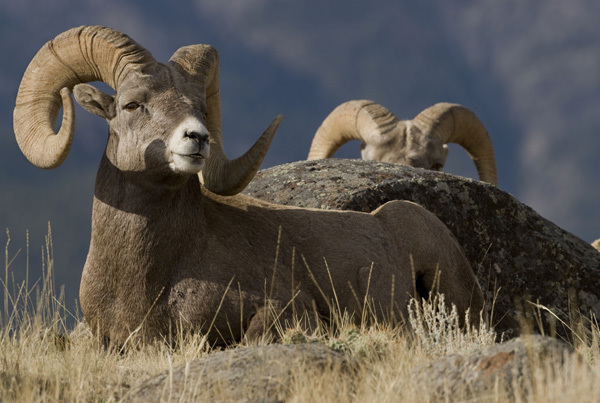 Depending upon the physical fitness of our group, and whether big horn sheep have been spotted within a realistic hiking distance, we'll work on big horns, too, if this requires hiking. Sometimes we film big horns right from the roadside! On several trips we have had great opportunities to film GRIZZLY BEARS. On a number of days during one tour, two young adult bears, recently driven off by their mother, grazed in the high country within a few hundred yards of the road, occasionally approaching within fifty yards, and three times, actually crossing the road in front of us. 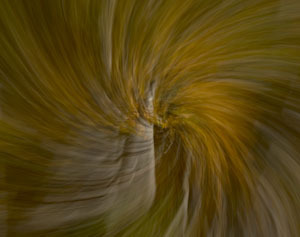 One year pine nuts failed, so as many as ten grizzlies foraged for grasses near the road. We found several. Although these opportunities may never happen again, you can be sure we'll be hoping that similar events occur again, and if they do, we'll be there ready to film. On another tour, along with the elk and pronghorn we filmed a huge big horn ram right from the road, and both trips had fantastic great gray owls! You just never know what you'll find. On still another photo tour we've had the best bull moose I've ever seen in Yellowstone, as well as big horn sheep, and another wonderful great gray owl, as well as mule deer, and cooperative sheep. As this paragraph implies, each year offers its own special gems, which is why each trip is magical and why we never get tired of going. For the best idea of exactly how each Photo Tour plays out, and what we photograph, check out any of our Trip Reports for Yellowstone. The text and the photos should answer all your questions about the subjects we photograph. At this time of year the fur of Yellowstone's large mammals is prime - new, thick coats in preparation for winter - and portraiture is at its best. Filming isn't very difficult, as it can be in winter, since deep snows will not separate you from your subject. Finally, the huge summer tourist crowds are largely gone, and you'll share the park mainly with other dedicated wildlife photographers. In fact, autumn in Yellowstone is the annual destination of many of North America's top wildlife photographers, and chances are you'll meet a few while we're there! Additionally, we feel there is another advantage in traveling with a group. Ethical concerns regarding the harassment of animals is a growing problem. We feel that a group has less impact on wildlife than does an individual photographer since a group can work cooperatively and responsibly in approaching animals, and, more importantly, a group can back off as a group if an animal shows any signs of stress. And we will do exactly that. 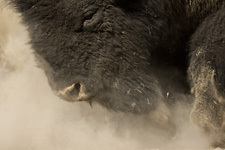 We're afraid that irresponsible behavior on the part of too many may, in time, limit the freedoms we now enjoy filming the wildlife in Yellowstone, and we are going to do everything we can to keep this from happening. 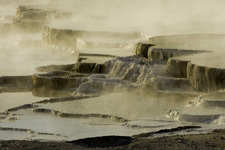 Finally, if this is your first time to Yellowstone and you're extremely interested in filming the geothermal areas and geysers, we'd suggest that you arrive early to tour the park on your own to do your geothermal photography. Car rentals are availalbe in Bozeman, and you'd still be able to meet our group at the Bozeman airport on Sunday prior to our drive to Gardiner. Some first-timers, we fear, hope to see everything on a tour, and with the time we devote to finding and filming wildlife that simply won't be possible. 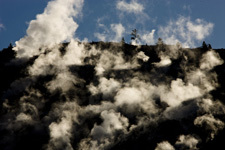 Usually, we do visit some of the scenic and geothermal areas of the park during the mid-day hours when the light isn't especially good for wildlife. 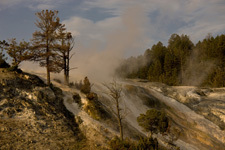 However, we won't be spending our prime light on geothermal activity if Yellowstone's mammals are active, for the landscapes can be filmed before or after the rut at many different times of the year. 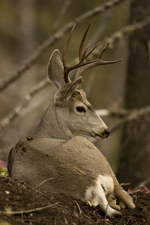 The prime mammal activity occurs only for a limited period each fall. 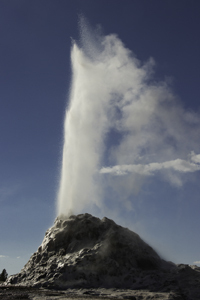 So, if you want old faithful at sunrise, come early or stay late and shoot that on your own. 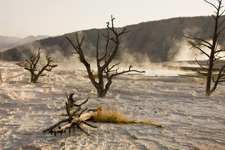 That said, we always visit the Grand Canyon of the Yellowstone and usually Canary Springs in the Mammoth Hot Springs area, but again, if the wildlife is too great we may miss one or more locations. 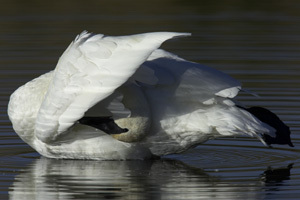 You simply cannot pass up a great wildlife shooting opportunity. This trip is a 'tour,' where our daylight hours will be involved in finding, and filming, subjects. Unlike our workshops where we conduct compositional exercises and offer review quizzes and instruction in a classroom setting, we'll be using our daylight hours solely for photography. That does not imply that we're not available to help you in whatever ways we can. 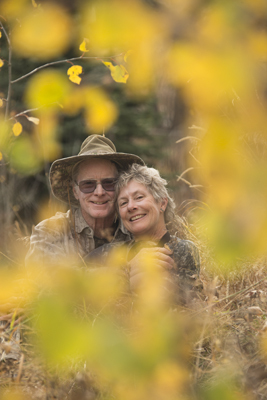 Mary and I will be offering our on-the-spot suggestions on the best way to compose the images before us, as well as suggestions on making the correct exposures, choosing the correct lenses, and obtaining the best perspectives. 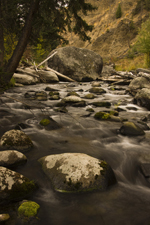 You'll not only make great photos, but you'll learn vital skills in photography as well. We will be providing you with a weeklong 'Shooting Assignment' that covers 21 different subjects. This assignment has proven to be a lot of fun, as it virtually guarantees there will always be great things to shoot, and this triggers instruction on technique, composition, exposure, and more. On Friday evening we'll do a digital slide show of all the participants' work, showcasing these 21 subjects as well as several personal favorites not on the list. The show is a wonderful conclusion of the trip! We're always there for you - if you have questions, if you'd like an opinion or a question on a composition, if you'd like to see what we're doing, whatever, We are there FOR YOU. We'll be with you, orchestrating the shoot to provide the best opportunities for our group. We won't disappear and let you to your own luck, although we also won't 'hang around the car' with those less motivated. We'll be there to photograph, hopefully side by side with all of our participants, and we hope that everyone will share that same enthusiasm to photograph. We're always there for questions, advise, guidance, and we are always looking for the best shots for our participants. Check out our trip reports and you'll see the results. DIGITAL PHOTOGRAPHY and the workload, image management, and editing always generates questions and opinions. On the tour during lunches or while we're driving, or during the day if we have the very rare day that is so miserable that we leave late or quit early, we'll have the opportunity to present our views, and to demonstrate our workflow and editing procedures. On one or more evenings we'll project slides or digital programs. 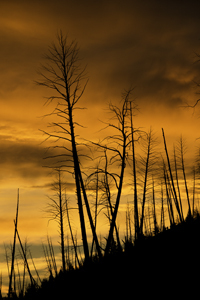 We'll give a short slide review of Yellowstone regarding composition and exposure on our first evening. You are encouraged to project 40 images, too, either in the form of slides or from your laptop and our digital projector and one evening we'll have a chance to enjoy, critique, and to learn from those images. This aspect of our trips is frequently among the most popular. Finally, we're available to answer all of your questions prior to the trip, and we'll be anxious to assist you in your efforts when we're afield in Yellowstone. Photo Course in Pennsylvanianext summer! Yellowstone is vast, and although the average tourist thinks they can 'see' the park in a single day, our in-depth photo safari will only scratch the surface in five full days. Although the emphasis of this tour will be the large mammals - the elk, moose, and pronghorn, we'll be carefully watching for every photographic possibility. 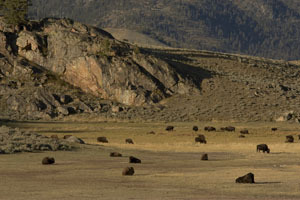 Most years the northern part of the park is best for elk and large mammals, and for that reason we'll be basing ourselves from just one motel in Gardiner. From there, adjacent the Mammoth Hot Springs, we'll work on pronghorn antelope, and hopefully moose, big horn sheep, elk, and mule deer. We'll also head deeper into the park - to Hayden Valley for bison, to the Grand Canyon of the Yellowstone for scenics and for birds, and to the Madison River for trumpeter swans. 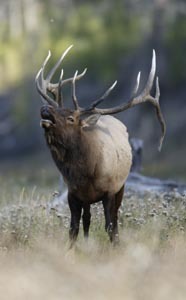 Gardiner and nearby Mammoth are also great for elk and we'll be within a 45 minute pre-dawn drive to the best spots for filming elk when the air is cold and crisp, the grasses covered with frost, and the light is magic. Our daily itineraries will be flexible, reflecting what subjects we've already filmed, what we still seek, what's suddenly available, and what the weather provides. 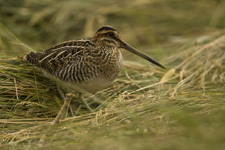 We do not follow a strict itinerary - with nature and wildlife that would be foolish and counter-productive. 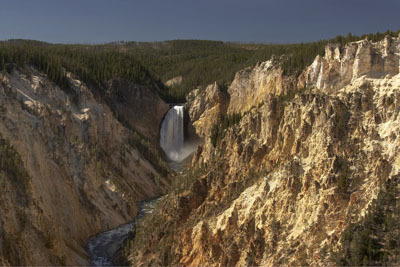 We follow a schedule that will provide you with as complete a coverage of Yellowstone as is possible, and we arrange our schedule accordingly. 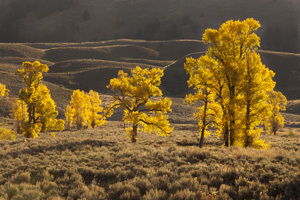 Yellowstone in autumn is a magnificent landscape, and we will take several opportunities to photograph these landscapes. Our shooting schedule revolves around our quest for wildlife, which generally starts at dawn, and continues as we drive to the park's hotspots. However, en route, we'll pass great aspen groves, meadows of fireweed, lakes filled with reflections, and forests burned by the famous Yellowstone fires. We will be stopping to shoot many of these landscapes, doing so depending upon the time of day, the beauty of a scene, or the 'free time' we have between visiting our wildlife stops. It is our policy to stop for photos whenever we see a great shot, whether that's an animal or a flower, and to stop whenever anyone in our group sees a photo - provided they let us know! We always stress to our groups that we'll stop when anyone sees a shot, but that we must know that they or YOU want to stop! Our point: we wish to stress that we'll be filming both wildlife and scenics, and that we're counting on you to help in this endeavor! 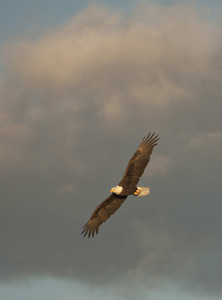 Our first priority is wildlife, but we'll do both as time and opportunity permits. Your fee includes the workshop and tour, field breakfasts and field lunches, lodging (based on double occupancy), and a welcome dinner in Gardiner, and ground transportation. Participants will receive a food list where we ask you to list the items you do not like; and Mary will shop based upon these lists. Our field meals are served picnic style, and they are very complete and nutritious. You won't be hungry, we can assure you! Dinners or any meals taken in town due to bad morning weather are not included in the price. We usually eat at affordable, but very nice diners or restaurants for our evening meal. Prices range from $6 to $20 for most meals, and western food is filling! On Sunday evening our participants are treated to a Welcoming dinner. Transportation in the park is included in the tour price. We'll be using two large passenger vans. Transportation includes pickup at the Bozeman airport Saturday, around 1PM, and a return to the Bozeman airport Thursday morning, around 11AM, and all group transportation during our shoot in the park. Should you miss a plane or arrive late, it will be your responsibility to meet the group at Gardiner. You'll be required to secure your own transportation to Bozeman if it is necessary for you to leave the tour before Thursday morning. Mary will provide a complete itinerary with motel phone numbers and alternative transportation for such emergencies. We strongly advise that you obtain trip/travel insurance if there exists the remotest possibility that you may have to cancel at the last minute or leave the tour before its conclusion on Saturday morning. Lodging is included and is based upon double occupancy. We'll do our best to make roommate matchups, if you choose to have one. There will be an additional charge for anyone requesting a single room. There's a space on the registration form indicating this. There is always something to shoot, and even when there may not be anything to shoot ... there actually are many, and we explore every possibility. 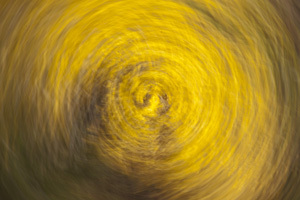 Sometimes with abstracts, or telephoto extractions, or whatever, but this creativity makes our tours unique. You won't waste your time simply driving around looking for animals - we photograph everything, and the result is a wonderful portfolio. We'll be forwarding a complete list of equipment recommendations to our registered participants. However, this tour will require long lenses for anyone seriously hoping to shoot frame-filling portraits of elk, pronghorn, or other large mammals. We suggest lenses of 300mm or longer. If you only own an 80-200mm zoom we'd recommend either purchasing a 400mm lens or renting a telephoto, unless you will be satisfied to shoot 'mammals in the environment' type images. Sigma makes a very sharp 400mm F5.6 lens that sells for under $500, depending upon the lens mount. Sigma also makes a great 150-600mm lens, and both Canon and Nikon make 100-400 and 80-400mm lenses that are very popular. These too can be rented. Too frequently people with short lenses attempt to do what people with longer lenses can do quite easily, which requires them to move in too close, either stressing the animal or putting themselves in jeopardy of being injured. That does not happen with our groups! Registered participants will be forwarded a complete list of suggested equipment and recommendations. September's weather can be erratic, ranging from 'typical Rocky Mountain autumns' to nearly winter conditions. Regardless, you can expect the mornings to be very cold, and gloves, and a wool cap, will be required. Typically, by mid-afternoon the weather warms up, and we advise people to wear layers that can be shed as the temperature increases. We might have heavy snow flurries - perhaps even a real snowfall, freezing rain, or damp fog, too, so we advise people to pack for cold, just in case. Mary will provide participants with a complete list of suggested clothing. Please be aware, too, that your safety is our primary concern. An early fall snowfall could make driving dangerous, and portions of the park may be less accessible at these times. We will not jeopardize the safety of the group, so if the roads are bad, we'll concentrate upon the pronghorns, sheep, and elk around the Gardiner and Mammoth Hot Springs areas, where the roads are almost always passable. 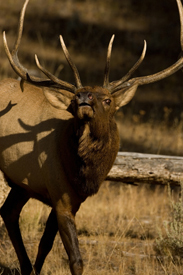 Late September is the annual rut for the elk. 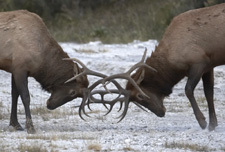 We hope to photograph bugling, herding behavior, and perhaps males fighting. Additionally, of course, we should be filming cows with older calves in a variety of habitats - along streams, near the geothermal areas, and in meadows. Moose bulls will be in their prime condition, and although they're very difficult to locate, we'll be traveling through the best areas for moose but we cannot guarantee moose. Our success rate with moose is about 20%, which isn't bad, considering there are only 100 moose in the entire park. We'll make a special effort to find some big horns sheep. There are some great locations where we usually find sheep, and some are quite close to the road. Sometimes sheep are located on high plateaus, and we might divide the group so that those who choose to can attempt a go of the sheep. 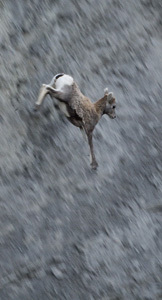 Pronghorns will be in their best coats, and these fast-moving mammals are fairly common and tame around Gardiner. 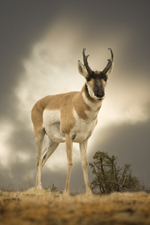 Pronghorn can be skittish, and we will try to find some habituated animals that we can photograph from the roadside. Sometimes it takes luck and hard work to get close to a good buck, but we're usually successful. 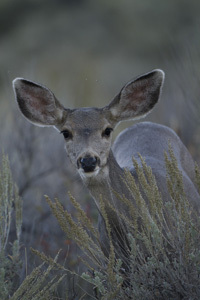 Additionally, we'll be watching for doe and buck mule deer -which are increasing since the fires of '88 and are becoming quite reliable, coyote, and trumpeter swans. We'll have the advantage when doing so because many animals are habituated, and very tame after dealing with the crowds of summer, and filming some elusive subjects may be easier, accordingly. As I mentioned earlier, we have done unbelievably well with grizzly bears on some of our fall shoots. Realistically, we can't expect that to happen but you never know. It's all luck. We've often had a mother black bear with three cubs - one year was spectacular for bears, but each year certainly differs. Again, the bears are there, but whether we'll be lucky or not will just depend upon our group's luck. There is a 100 yard rule for bears, so any photography of bears will certainly be only from the roadside. We will not approach bears! Coyotes are usually seen in the fall, and some are quite tame and we once worked some coyotes for almost an hour. Gray wolves have enjoyed a tremendous comeback since their reintroduction several years ago. Last year we missed a kill by a day! Typically our groups see wolves, but unless a kill or carcass is fairly close to the road photography is very limited. 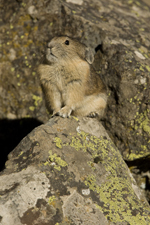 There are some other mammals too, including least chipmunks, pikas, and red squirrels that we usually shoot, or have the opportunity to do so. 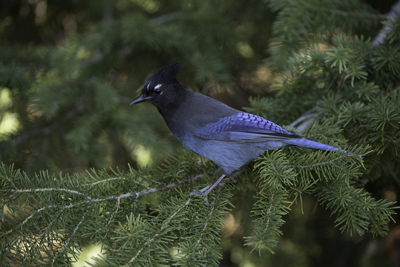 Some animals, as well as some birds like the common raven, gray jay, and juncos, often fly about while we're having our picnic meals and, too often, they're ignored. Believe me, if it's worth shooting we won't be ignoring a subject! 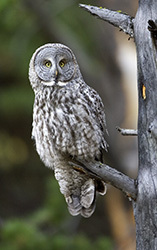 Great gray owls, North America's largest species, are uncommon in the park, but we've had great luck over the years at frame-filling distances with 400mm+ lenses. The owls are tough to find - but we've done well, on average, and we hope to do so again. Like all wildlife, however, nothing is guaranteed. Of course there are other birds, including trumpeter swans and Clark's nutcrackers and Mountain bluebirds and Common Ravens, and we usually do quite well in filming several different species. Landscapes - geysers, steam landscapes, meadows and streams, lakeshores, rivers, mountains, boulder fields, basalt columns, fireweed meadows, burned out skeletal forests, aspen groves, cottonwoods lining rivers, waterfalls - is your appetite whetted? We'll film many of these subjects during the course of your week. With DIGITAL PHOTOGRAPHY it is especially easy to do panorama shots where several images are shot and composited. We'll show you how to do so in the field, will show you some examples, and if time permits we will demonstrate the technique in how to put a panorama together. Location: Based in Gardiner, MT (Saturday night through Wednesday night). Accommodations: Lodging is included. We'll be staying at one of the newest and nicest motels in Gardiner, the Absaroka Lodge. Single supplement is available for a fee. Photo Tour Duration: Pickup at Bozeman airport (one time, only) between 11AM and 2PM, on the first day of the tour. The tour begins at 4:30PM, Monday, on the first day of the tour. Transportation back to Bozeman by 11AM, Saturday, on the last day of the tour. Transportation: Included, to/from Bozeman (one trip) and transportation through the park. If you cannot make our pickup on Saturday, or if you are required to leave the tour early, you will be responsible for transport to or from Bozeman. Karst Stages does pickups at the Bozeman airport and has a run both to West Yellowstone and to Gardiner. 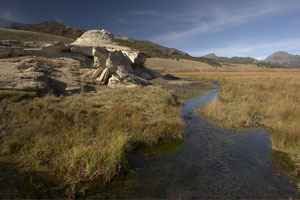 Make sure, if you'd need to use Karst Stages, that you do not travel to West Yellowstone by mistake. Alternatively, you could take a taxi, but you'd actually be better off renting a car for the week for about the same price. In short, don't miss our Saturday pickup. If your flight is delayed, we will wait for as long as we can without compromising the group, and if we can wait depends upon how many people we are picking up and taking down to Gardiner. 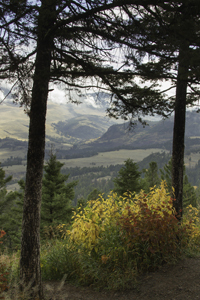 Includes picnic breakfasts and lunches, lodging (double occupancy), transportation from Bozeman to Yellowstone and return to Bozeman, and transportation within the park, and all handouts. For our cancellation and payment schedule, please see our paper detailing same. Liability Release: Our release form, and perhaps one from the national park, must be signed prior to participation. 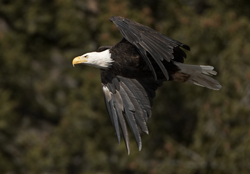 View a brief Yellowstone Wildlife Portfolio. Return to HomePage or to General photo tour information.